1. 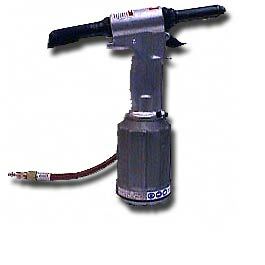 With tool in any position, vacuum holds fastener firmly in nose assembly. 2. Vacuum expels broken pintail into pintail collector. Pulling action of the pull piston is provided by a pneumatic-hydraulic (pneudraulic) intensifier system powered by 90-100 psi air pressure. 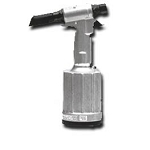 The air inlet is equipped with a connector with 1/4-18 female pipe threads to accept your air hose or quick connect fitting. The piston return stroke is spring actuated.